Cornwall is a city in Eastern Ontario, Canada, and the seat of the United Counties of Stormont, Dundas and Glengarry. Cornwall is Ontario's easternmost city, located on the Saint Lawrence River in the Quebec City–Windsor Corridor along Ontario Highway 401, and is the urban centre for surrounding communities, including Long Sault and Ingleside to the west, Mohawk Territory of Akwesasne to the south, St. Andrew's and Avonmore to the north, and Glen Walter, Martintown, Apple Hill, Williamstown, and Lancaster to the east. Cornwall lies on the 45th parallel, approximately 100 km (62 mi) southeast of Ottawa, the national capital, 120 km (75 mi) southwest of Montreal, Quebec's largest city, and 440 km (270 mi) northeast of Toronto, the provincial capital and Canada's largest city. It is named after the English Duchy of Cornwall; the City's coat of arms is based on that of the duchy with its colours reversed and the addition of a "royal tressure", a Scottish symbol of royalty. There were 69% anglophones and 30.5% francophones as of 2001. Its largest industries include logistics distribution and call centres. Aboriginal peoples have lived in and around the area of present-day Cornwall for millennia. Though accounts suggest Europeans filtered into the area and had scattered settlements for some time, the first documented European settlement was established in 1784 by United Empire Loyalists, primarily from the former British colony of New York. After the war for American independence, former colonial soldiers loyal to the Crown and other disbanded soldiers and their families began to settle at the site of Cornwall, then called New Johnstown. Many of the new arrivals were of German origin, with the town being named for Johnstown, New York where many came from. The main group were led by Lieutenant-Colonel Sir John Johnson and were soldiers from the First Battalion King's Royal Regiment of New York and a contingent of the 84th Royal Highland Emigrants. Following the success of rebellious colonists in the American Revolution, many of those on afraid for their lives or uncomfortable in the newly independent United States would become "United Empire Loyalists", as they were later called, and migrated to Canada. The British government helped them settle throughout the Canadas as a reward for their loyalty and to compensate them for their losses in the United States. One of the chief settlement regions was the St Lawrence River valley, from Kingston to Cornwall, which would later be known as "loyalist country". They founded a settlement on the site formerly called Pointe Maligne by French colonists and renamed it "Royal Settlement #2", and, later, "New Johnstown". It was later renamed Cornwall by the British for the Duke of Cornwall by proclamation of Prince George, and in 1834 the town became one of the first incorporated municipalities in the British colony of Upper Canada. The construction of the Cornwall Canal between 1834 and 1842 accelerated the community's development into a regional and industrial economic "capital" for a growing hinterland of towns and villages. In 1846, the population was about 1,600 and there were many brick and stone houses as well as a stone courthouse and jail. Several government offices were located here. There was little industry, except for a foundry and two tanneries, but many independent tradesmen of various types worked there. Other amenities included two bank agencies, eight taverns and a ladies' school. Canal and lock construction in the late 1800s and early 1900s brought work and international business. Railway connections, beginning in the 1850s, provided connections between Cornwall and local communities that required access to public services in Cornwall itself, such as high schools and medical services, and helped cement Cornwall's position as a regional centre for a large, rapidly expanding and increasingly populated rural hinterland . The network of villages and towns surrounding Cornwall helped make the city a local entrepot for business, commerce, media and services. In 1944, the city was rocked by the magnitude 5.8 Cornwall–Massena earthquake. There were no deaths or injuries reported, but several chimneys were destroyed or damaged, along with heavy damage to historical masonry structures. For example, the Cornwall Collegiate and Vocational School received heavy damage from masonry work falling through the roof of the gymnasium. Situated west of Cornwall along the St. Lawrence River were several smaller communities. Now known as the Lost Villages, the communities were permanently flooded in 1958 during the construction of the St. Lawrence Seaway as the massive Moses-Saunders Power Dam at the western end of the city required a reservoir. The villages were flooded when it was filled. Much of the Cornwall region's local character also changed at this time. Eastern Ontario has always been a highway or corridor through which people moved, a corridor used by migration and conquest. Prior to European colonization, the Mohawks and Six Nations Iroquois settled, raided and battled through the St. Lawrence valley. The French and British fought over the waterway, often using and being used by native allies in highly complex economic competition. Later, after thirteen of the British colonies declared independence and became the United States, during the War of 1812, it became a battleground between Americans and the people who would become today's Canadians. Formally founded to be a new home for refugees from the American Revolution, it remained a home for refugees and migrants for much of its history. Early settlement of the region is largely undocumented although oral histories and early accounts suggest that European settlers, traders and farmers lived in the area long before formal state recognition, and had been interacting with the native population for most of that time. The post-contact regional population was a mixture of French Canadian, Ojibwe and Mohawk residents. To this mix was added an influx of American English Loyalists and refugees from the Thirteen Colonies (now the United States), other French Canadian and Acadian migrants and, later, poor Scottish and Irish immigrants and refugees who arrived from overseas and from other parts of Canada. These different groups mixed and integrated over time, with family names and histories reflecting a blending of different backgrounds that became typical of Eastern Ontario. Smaller but nevertheless impressive contributions in the region were made by a host of other migrants, from Jewish traders, craftsmen and merchants, to Eastern European refugees and even a significant body of former slaves. Many of these stories go unreported in standard histories, which pass over the remarkable history of migration in the region. One good example is the story of John Baker who died in Cornwall in 1871 at the age of 93. Born in Lower Canada, he was said to be the last Canadian born into slavery, and had been an active soldier in the War of 1812, fighting in both Canada and Europe. Slavery was ended in the colony of Upper Canada in stages, beginning in 1793 when importing slaves was banned, and culminating in 1819 when Upper Canada Attorney-General John Robinson declared all slaves in the colony to be freed, making Upper Canada the first place in the British Empire - and, in fact, the world - to unequivocally move towards formal abolition of chattel slavery. Most of these former slaves settled and integrated into the same communities where they were freed. By 1833, this process of liberation had succeeded throughout the Empire and all slaves in the British Empire were free. The British Empire was the first major state in world history to abolish slavery, and Ontario was the place where this process first bore fruit. John Baker, the last slave to be born into slavery in Canada, died in Cornwall. "Canada" had been stripped from France after the Seven Years' War, and this included roughly the areas now covered by the Canadian provinces of Quebec and Ontario. In the aftermath of the American Revolution, the British authorities split the Province of Canada in 1791 into two, Upper Canada for English settlers fleeing persecution in the United States and Lower Canada for the French (later, Ontario and Quebec). This was designed to accommodate Loyalists who had fled post-war reprisals and persecution in the new United States, though the 5,000 English-speaking settlers in the Eastern Township of Quebec were allowed to stay in the French-speaking area and many French settlers moved into Ontario. Along with the area's original inhabitants, this made the area a patchwork of intersecting ethnicities that would end up blending to a great degree. Cornwall and the surrounding area, originally called "Royal Settlement #2" and then "New Jamestown", was initially a rough place and was largely left to its own devices. According to contemporary reports, this bred a local culture of intense self-reliance. Adding to this initial history of pragmatic entrepreneurialism, beginning very early with the founding of the city, provincial and federal governments have typically neglected the area, treating it as little more than a transit corridor. Those who remained in the region tended to be those who had the fortitude and energy to survive on their own, with little outside assistance. "The original 516 settlers arrived in Royal Township #2 with minimal supplies and faced years of hard work and possible starvation. Upon their departure from military camps in Montreal, Pointe Claire, Saint Anne, and Lachine in the fall of 1784, Loyalists were given a tent, one month's worth of food rations, clothes, and agricultural provisions by regiment commanders. They were promised one cow for every two families, an axe, and other necessary tools in the near future. For the next three years, bateaux (boat) crews delivered rations to the township, after which residents were left to fend for themselves." The region's energetic spirit of enterprise and fortitude was well known in the 19th century. David Thompson, the Welsh-Canadian explorer who mapped the Far West and was called the greatest land geographer in history, drew many of his traveling companions from Cornwall's rural hinterland, drawing on Scottish and native settlers, and himself lived in Williamstown. More recently, Cornwall has seen an increase in the arrival of new immigrants, who tend to integrate and often fare better than immigrants in other parts of the country. The Cornwall region was unusually integrated for rural counties in Ontario. For hundreds of years, the local population has been characterized by a mix of economic migrants, refugees and opportunists. Mixing of different social classes and ethnic backgrounds was common even early in its history, due to the interdependence demanded by isolation and the lack of either support from or interference by official authorities. The original Native population was remarkably welcoming, and the Iroquois were especially well-known for integrating newcomers into local societies and for adapting to change as it happened. Many people in the region have some Native ancestry as a result, and many communities sit on sites that have been occupied, farmed or managed for hundreds of years. While some people were pushed out, others simply blended into new communities in a process that would go on continuously over many generations. Lack of strict hierarchy was a characteristic of the region. For example, during the 1780s–1830s, a "Bee" was a social event that pooled local labour resources, when people would come together for collective projects or to help out individual families, and was often a festive occasion. These early "Bees" presaged the development of a varied and integrated culture that ultimately drew on many different classes, backgrounds and ethnic and linguistic groups, all of whom were forced by the harsh reality of life in the region to work together for common goals, the primary of which was survival. These "Bees" and different forms of collective, shared labour were extremely common in Eastern Ontario generally, and especially so in the early villages of the St. Lawrence valley. "In her book "Roughing It in the Bush", Susanna Moodie observed that "people in the woods, have a craze for giving and going to bees and run to them with as much eagerness as a peasant runs to a race." Bees often involved all ranks and nationalities of society. Thomas Need, a sawmill operator in Victoria County, described in From Great Wilderness to Seaway Towns the raising of his facility in 1834 in the following way: "They assembled in great force and all worked together in great harmony and good will not with- standing their different stations in life." These gatherings exhibited the lack of aristocracy in the rural loyalist settlement along the St. Lawrence River and residents' disregard for individuals' former social standing or lineage... The harshness and isolation of frontier living prevented the development of an aristocracy and, instead, united all members of the community in a struggle for survival. Early Loyalists, regardless of the amount of land they owned, depended upon the help of their neighbors to clear land, build homes, and share supplies and food during times of poor harvests." Cornwall has traditionally been a gateway from the Montreal area to the rest of Canada, and was and remains a major port-of-entry into Canada (Canada Border Services abandoned the Cornwall Island post May 31, 2009, but resumed service on July 13, 2009 at temporary facilities on the city's southern edge.) With the completion of the new low-level bridge connecting Cornwall to Cornwall Island, the C.B.S.A. port was moved to a permanent temporary facility on the canal lands. The city is connected to the United States at Roosevelttown near the municipalities of Massena, New York and Malone, New York, via the Three Nations Crossing (Canada, Mohawk, and United States) which traverses the St. Lawrence River. Cornwall was once home to a thriving cotton processing industry. Courtaulds Canada, Inc.'s rayon manufacturing mill operated until 1992; at one point it employed nearly 3,000 people. Domtar, a Quebec-based company, operated a paper mill in the city for nearly 100 years, ceasing operations on March 31, 2006. At its peak, Domtar employed nearly 1,500 employees. In addition, Canadian Industries Limited (C.I.L. ), has operated a plant in Cornwall since 1935. The facility has been converted into a major derivatives plant. The site has a long history of mercury contamination, given that for decades the chlor-alkali process was carried out here. This entailed using used mercury cells to convert brine into caustic soda and chlorine. Cornwall's industrial base has now shifted to a more diversified mix of manufacturing, automotive, high tech, food processing, distribution centres and call centres. The City hosts the largest supply chain management distribution centre in Canada, Walmart, its massive 1,500,000-square-foot (140,000 m2) facility employing nearly 1000 people. Target Canada built a new distribution centre in Cornwall's Business Park on a 169-acre (68 ha) parcel of land. The Target Canada distribution centre was operated by Eleven Points Logistics. When Target left Canada, their distribution centre was assumed by Walmart. StarTek, now closed, and Teleperformance (closing Jan 2013) both operated call centres in Cornwall. Teleperformance provided in excess of 300 jobs. In late 2008, Shopper's Drug Mart built a 500,000 sq ft (46,000 m2). distribution facility in Cornwall's Business Park. Over 130 new jobs resulted. Service Canada established a new contact centre which opened in 2010. Over 170 new jobs were created. Cornwall's unemployment rate was about 4% at the time. MoneySense magazine rated Cornwall as Canada's 167th best place to live (out of 190), in 2012. Cornwall Square, also known as "The Square", is a two-level 250,000-square-foot (23,000 m2) shopping mall within Cornwall. In 2016, Cornwall had the 11th lowest household median income in Canada and second lowest in Ontario, at $51,712. The 2006 census indicates that English is the first language of approximately 68% of the population, while 30% count French as their first language. The remainder speak numerous mother tongues, including (among others) Mohawk, Greek, Italian, Urdu, Hindi, Arabic, Bosnian, and Tamil. The Cornwall City Council is governed by an elected eleven-member municipal government composed of a mayor and ten councillors who serve four-year terms and represent the City as a whole. The current Mayor of Cornwall is Bernadette Clement. She won the election in October 2018. The former Mayor of Cornwall was Leslie O'Shaughnessy, former reeve of the nearby Charlottenburg township. He secured his position in October 2014 by obtaining 50% of total votes, ending former Mayor Bob Kilger's two-term stint. At the 2010 municipal election, 56.5% of eligible voters did not vote as out of 30,655 registered voters, only 13,338 cast ballots (43.5%). Cornwall is located within the Stormont—Dundas—South Glengarry riding. Since 2011, the riding has been represented by MPP Jim McDonell (Progressive Conservative Party of Ontario). Stormont—Dundas—South Glengarry is represented federally by MP Guy Lauzon (Conservative). John Sandfield Macdonald, the first Premier of Ontario, was from Cornwall and is buried in St. Andrews West at the Catholic Church cemetery. The City of Cornwall hosts festivals and special community events including Canada Day festivities, and Kinsmen Cornwall Lift Off, an annual hot air balloon and music festival. Cornwall is named after the County of Cornwall in the United Kingdom. Its flag also bears the insignia and colours of the flag of the Duchy of Cornwall. Lift Off was an annual music and hot air balloon festival that took place in July in Lamoureux park. It was run by a board of volunteers and was a non-profit organization. Lift Off was the only hot air balloon festival in Ontario. Paying individuals were able to take a 20 or 90 minute ride in one of 25 sponsored balloons. Kinsmen Cornwall Lift Off promoted a variety of local and national talent. Acts included Glass Tiger, Kim Mitchell, Sass Jordan, Tom Cochrane, Trooper, Burton Cummings, and David Wilcox. The 2014 lineup featured Great Big Sea's Alan Doyle, Glass Tiger and 54-40 as headliners. This edition was the first to offer a full day of free entertainment with Glass Tiger headlining. It was attended by over 9,000 people. 2014 was the final year for the Lift Off festival, as debt from a weather-plagued 2013 event and failure to obtain sponsors forced the cancellation of Lift Off 2015 and resulted in a decision to discontinue to the festival. Cornwall Ribfest is an annual festival held by the Optimist Club of Cornwall. It was originally sponsored by the Cornwall Seaway Lions Club. Taking place over four days in late July, Ribfest attracts many for barbecue, free live music and carnival rides. The 2014 edition of the festival attracted 57,000–60,000 attendees, a number greater than the population of the city. Cornwall Collegiate and Vocational School became a grade 7–12 school after amalgamating with General Vanier Intermediate School for the 2011–12 school year. The school celebrated its bicentennial in 2006 and, is the oldest school in Canada. CCVS offers a complete French immersion program in grade 7–12. St. Joseph's Secondary School is a part of the Catholic District Board and offers French immersion education. The newest high school in Cornwall is Holy Trinity Catholic Secondary School for grades 7 to 12, opened in response to overpopulation at St. Joseph's. Both schools offer French immersion education. Cornwall also has two French high schools: l'École secondaire publique l'Héritage, and l'École secondaire catholique La Citadelle. La Citadelle is part of le Conseil scolaire de district catholique de l'Est ontarien. It is home to students from grade 7 to 12. École secondaire publique l'Héritage is part of the Conseil des écoles publique de l'est de l'Ontario and is home to grade 7 through 12 students. Saint Lawrence Secondary School hosts students in grades 7–12. It originally was a high school, located where La Citadelle is now. Around 2003, it was turned into a school for grades 7–10. Now it has transitioned back into a high school for grades 7–12. 2012 was to be the first year since 2003 that grade 12s will graduate from the school. Al-Rashid Islamic Institute is the first Islamic school of any kind in North America, providing higher educations Islamic studies with the boarding facility. Census results from Statistics Canada indicate that 28.6% of adults (20 – 64 years) did not finish high school. A campus of St. Lawrence College is situated in Cornwall. The St. Lawrence River Institute of Environmental Sciences is located on the College campus, and, among other academic and vocational offerings, provides an Environmental Technician program. The St. Lawrence River Institute of Environmental Sciences is a research centre that carries out ecotoxicological studies on large river systems and, in particular, on the Great Lakes/St. Lawrence River ecosystem. Cornwall is home to the Canadian Forces School of Aerospace Control Operations (École des opérations de contrôle aérospatial des Forces canadiennes), also known as CFSACO. CFSACO offers a range of basic and specialty courses and conversion training to Canadian Forces personnel. Military members are trained to become either Air Traffic Controller/Operators or Air Weapons Controller/Operators. Nav Canada, Canada's air navigation service provider, formerly conducted training of domestic Air Traffic Controllers in Cornwall at the Nav Canada Training Institute and Conference Centre; Air Traffic Control training is now limited to international clients. The Centre still hosts training for technical operations, and leadership. The Cornwall Tool Library is situated in Cornwall. Cornwall does not enjoy a positive environmental reputation as a result of decades of industrial pollution in the city, the legacy of which is a riverfront contaminated by mercury, zinc, lead, and copper, soil contaminated by coal tar and byproducts, and most evidently, "Big Ben", an 18-hectare (45-acre), 80-metre tall dumpsite within the city filled with wood bark, paper mill sludge, demolition waste and asbestos. In September 2008, over public opposition and in spite of Ontario Ministry of Environment (M.O.E.) reports indicating off-site leachate impact from the dump and the likelihood of runoff to the St. Lawrence River, the M.O.E. permitted additional dumping at the "Big Ben" site of creosote and bitumen-contaminated soils from Domtar's former No-co-rode Ltd. site. Although the area is touted as recreational, it is off-limits until winter when the waste is covered and the odours are subdued. It is then used as a ski hill. For years, the industrial emissions in the Cornwall area fuelled public health concerns about respiratory disease and cancer. In 1995 Health Canada reported the rate of hospitalization for asthma was approximately double that of cities such as Hamilton, Sudbury and Windsor. Further research, showed that infants under two years of age had four times the expected hospital admission rate for asthma. Lung and male rectal cancer rates were also elevated in comparison with the rest of the province. The shutdown of the Courtaulds rayon fiber operation (1992) and the Domtar paper mill (2006) have been a significant factor in the City's improved air quality. Cornwall now consistently ranks in the top 10 of 40 monitored communities across Ontario. More recently, a Pembina Institute study of 29 communities across Ontario looked at a number of environmental, social and economic factors. Cornwall ranked 13th overall, and its air quality was ranked #1 in the province. Cornwall was at one point one of only two cities left in the Province of Ontario with only primary sewage treatment facilities. But construction was started in May 2012 on the secondary treatment level plant with the Governments of Canada and Ontario each covering one-third of an estimated $55.5 million construction cost. The City picked up the remaining one-third of the cost of $18.5 million. The secondary treatment level plant was completed in November 2014. In 2006, the City updated its Strategic Plan, including the objective to develop an environmentally-sustainable community. In 2007, a former city councillor, Naresh Bhargava, began working with the St. Lawrence River Institute of Environmental Sciences on a project called the Community Carbon Reduction Initiative. City Council provided $5,000 in start-up funding for the project. Earlier, progress in energy conservation was made in the 1990s when a co-generation plant went into operation that provides 4% to 6% of the City's daily electrical needs while at the same time heating a number of buildings, including both hospital sites. Cornwall also converted all of its traffic signals in 2002 to energy efficient LEDs that have reduced power usage by more than 600,000 kW—enough to light close to 70 homes. The data were contained in a report prepared by the City's public works department. Similar to most of southern Ontario, Cornwall has a humid continental climate (Köppen Dfa/Dfb) with cold, snowy winters and warm, humid summers. Precipitation is significant year-round although the winter months are generally drier than the summer months. With a fleet of 24 buses, Cornwall Transit operates 6 days per week (excluding Sundays and holidays) on fixed routes and supplementary "rush-hour" routes. In addition, there is an on-demand "Handi-Transit" service for the disabled. Cornwall Transit also contracts taxi service at a flat rate for Handi-Transit registrants who are ambulatory. Cornwall Transit transports about 787,000 passengers per year. At one time Cornwall had a street car system. Cornwall is served by the Cornwall Regional Airport located 10 km (6.2 mi) east of the City near Summerstown. It is open year-round and licensed for day and night VFR IFR operations. The facilities include a 3,500 ft × 100 ft (1,067 m × 30 m) runway, a terminal, hangar, and the Canada Border Services Agency (on request). Domestic and international charter flying service from the airport is offered by Cornwall Aviation. Cornwall is located on CN Rail's mainline Quebec City-Windsor corridor and served by passenger intercity trains operated by Via Rail. The Station is located in the City's north end. The City of Cornwall is on the St. Lawrence Seaway just east of the Eisenhower and Snell Locks. The Cornwall Harbour and Government wharf are located on the north bank of the St. Lawrence River in the City's east end. Cornwall has two indoor arenas, the Cornwall Civic Complex and the Benson Centre with three ice surfaces. Cornwall has been home to a variety of sports teams, the most notable of which was the Cornwall Royals hockey team which played in both the Quebec Major Junior Hockey League and the Ontario Hockey League before moving to Newmarket in 1992. The Royals won the Memorial Cup in 1972, 1980 and 1981. Between the years 1993–1996, the Cornwall Aces, an AHL franchise, was in town. They were the farm team for the NHL franchise the Quebec Nordiques/Colorado Avalanche. The Cornwall Colts are the current Junior A team playing in the Central Canada Hockey League. Cornwall has hosted several major sporting events in its history including the Ontario Winter Games and Special Olympics. In 2008, Cornwall hosted the Royal Bank Cup, the National Championship for Junior A hockey teams. The Cornwall Colts finished third in the series, winning 2 of 5 games. The Cornwall Colts hosted the Fred Page Cup in 2015 for the Eastern Canadian Championship. Today, the teams represented in the Fred Page Cup are the Maritime Hockey League Champions (Kent Cup), the Ligue de Hockey Junior AAA du Québec Champions (Napa Cup), the Ottawa District champions of the Central Canada Hockey League (Bogart-Nielsen Cup), and a host team chosen by committee two years before the tournament. The Cornwall River Kings of the Ligue Nord-Américaine de Hockey (LNAH) started playing out of the Civic Complex in the fall of 2012 but folded in 2016. The River Kings were replaced by the Cornwall Nationals of the Federal Hockey League, who folded during the 2017–18 season. Cornwall's competitive swim team is the Cornwall Sea Lions, currently under the coaching of Simon St. Pierre. Two swimmers, Hannah Riordan and Tess Simpson competed at junior international level. Riordan and Simpson have also represented Canada at the second FINA World Junior Championships the Tri-Nations Cup, and Riordan competed in the Junior Pan Pacifics, and Simpson in the Australian Youth festival. Four swimmers attained scholarships at NCAA schools (Riordan – Auburn, Simpson – Texas A&M, Megan Suffel – University of New Hampshire and Claudia Dugual at Drexal). These four swimmers all received their fastest club times while under the coaching of Robert Eynon. Cornwall has three soccer areas, the Kinsmen Junior Soccer Field at Second Street West and Haulage Road; The Benson Centre (for indoor soccer); and Optimist Park on Sunnyside Street and St. Michel Drive. Cornwall has competitive men's and women's rugby clubs. After many years without rugby in the community, it saw a resurrection in 2006. Both teams compete in the Eastern Ontario Rugby Union which is located in Ottawa. The home of the Cornwall Crusaders Rugby Football Club is Cornwall Collegiate and Vocational School. The men's and women's teams practice Tuesdays and Thursdays from April until the end of August. The men's team has found success in recent[when?] years, winning the Eastern Ontario Men's Division 1 Championship in 2009 and 2010 against the Napanee Outlaws and the Gatineau Mirage, respectively. The sport of rugby continues to grow in the community. Many high schools throughout Stormont, Dundas, and Glengarry have junior and senior boys' teams as well as varsity girls' teams. These high school teams serve as feeders to the Cornwall Crusaders. Many players who play on the Crusaders today come from high schools in the S.D.& G. area. Roller Derby The Seaway Roller Derby Girls Association is the first roller derby flat track roller derby league in Cornwall and SD&G Counties, established in 2011. The Power Dames is the first official team. Girls' basketball The United Counties girls' basketball team won provincial and international basketball tournaments in the late 1970s and early 1980s. In addition, the city offered girls' and women's basketball from age eight to college graduates. The San Lawrence College women's team won a college tournament as well. The teams were coached by Adelore Bergeon and Alan Haskvitz. Some stations from other nearby areas, including Ottawa, Montreal and New York's North Country, are also available. Cornwall Standard Freeholder is the City's main daily newspaper and is managed by Sun Media, a division of Postmedia Network Inc.
Seaway News is a weekly newspaper owned by TC Media, and includes pages from the French-language L'Express. Le/The Journal de Cornwall is another weekly newspaper. Once solely French, the paper is now bilingual. The Seeker is a locally owned weekly newspaper distributed both door to door and in stores which focuses on arts, culture and events. ^ a b "Cornwall census profile". 2011 Census of Population. Statistics Canada. Retrieved March 21, 2012. ^ a b "Cornwall (Census agglomeration) census profile". 2011 Census of Population. Statistics Canada. Retrieved March 21, 2012. ^ a b "Cornwall, Ontario". Canadian Climate Normals 1981–2010. Environment Canada. Retrieved October 27, 2013. ^ a b "Founding of Cornwall, The". Ontario Heritage Trust. Retrieved January 17, 2019. ^ Parham, Claire Puccia (2013). From Great Wilderness to Seaway Towns: A Comparative History of Cornwall, Ontario, and Massena, New York, 1784-2001. SUNY Press. p. 46. ISBN 0791485676. ^ Smith, Wm. H. (1846). Smith's Canadian Gazetteer - Statistical and General Information Respecting all parts of The Upper Province, or Canada West. Toronto: H. & W. ROWSELL. pp. 38–39. ^ "Mille Roches". The Lost Villages Historical Society. Retrieved January 17, 2019. ^ "Cornwall and the War of 1812". Choose Cornwall. Archived from the original on August 19, 2016. Retrieved November 4, 2014. ^ a b c "The Early Settlement of Cornwall, Ontario and Massena, New York, 1784–1834" (PDF). SUNY Press. Archived from the original (PDF) on June 11, 2014. ^ "THE ENGLISH PERIOD (A.D. 1760 TO 1867)". Ontario Archaeology Society. Archived from the original on March 8, 2013. ^ J. F. Pringle (1890). "XXXVI". Lunenburgh, or the Old Eastern District. Judge Country Court. Archived from the original on August 16, 2016. ^ "John Baker Report" (PDF). The Harriet Tubman Institute. Archived from the original (PDF) on August 19, 2016. Retrieved November 4, 2014. ^ "Slavery Abolition Act, 1833". The Canadian Encyclopedia (published July 10, 2014). January 29, 2015. Archived from the original on November 4, 2016. ^ "Update on Cornwall's Economy". Eastern Ontario Training Board. Archived from the original on August 13, 2016. Retrieved November 4, 2014. ^ Lajoie, Kevin (June 20, 2008). "Group suing ICI, others for $40M". Cornwall Standard-Freeholder. Archived from the original on January 27, 2016. 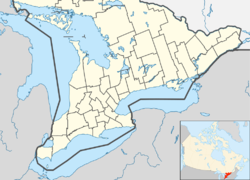 ^ "Hawkesbury and Cornwall residents have lowest incomes in Eastern Ontario". Archived from the original on August 14, 2010. Retrieved September 26, 2010. ^ Ottawa, Petawawa, top Ontario income rankings CBC News, September 13, 2017. ^ a b "2006 Community Profiles: Cornwall, Ontario (city)". Statistics Canada. Retrieved January 17, 2019. ^ Hazelton, Cheryl (October 27, 2014). "Cornwall Chooses Change". Web: Standard Freeholder. Archived from the original on November 5, 2014. Retrieved November 7, 2014. ^ a b Cornwall Lift Off. "Our Story". Kinsmen Cornwall Lift Off. web. Archived from the original on November 1, 2014. Retrieved November 14, 2014. ^ The Great Waterway. "Up, up and away!". The Great Waterway. Web. Archived from the original on November 29, 2014. Retrieved November 14, 2014. ^ Kinsmen Cornwall Lift Off. "2014-entertainment-schedule". Kinsmen Cornwall Lift Off. Web. Retrieved November 14, 2014. ^ Cornwall Seeker. "About 9000 in attendance for Lift off 2014 opening night". Cornwall Seeker. Web. Retrieved November 14, 2014. ^ Cornwall Lift Off. "Lift-Off won't return". Cornwall News Watch. web. Retrieved December 7, 2015. ^ "Changes in store for Ribfest 2017 — Cornwall Standard Freeholder". Archived from the original on February 2, 2017. Retrieved January 28, 2017. ^ Healey, Eric. "Ribfest 2014 a tasty hit". Standard Freeholder. Web. Archived from the original on November 5, 2014. Retrieved November 7, 2014. ^ St. Lawrence River Institute of Environmental Sciences – A leader in research, education, & community action. Riverinstitute.ca (June 28, 2012). Retrieved on 2013-07-12. ^ "International Joint Commission Assessment". p. 7. Archived from the original on September 27, 2007. ^ "Canada's RAP Progress Report 2003: St. Lawrence River (Cornwall)". Environment Canada. Archived from the original on March 12, 2005. ^ "Big Ben Recreation and Landfill Area". Archived from the original on November 6, 2007. Retrieved February 22, 2008. ^ "Cornwall". Canadian Climate Normals 1981–2010. Environment Canada. Retrieved July 23, 2016. ^ "Cornwall". Canadian Climate Data. Environment Canada. Retrieved July 23, 2016. ^ "Daily Data Report for July 1868". Canadian Climate Data. Environment Canada. Retrieved July 23, 2016. ^ "Cornwall city hall inks deal with FHL Nationals". Standard-Freeholder. September 14, 2016. Archived from the original on September 17, 2016. Retrieved September 16, 2016. ^ Griffin, Mary (August 2, 2011). "Coventry's twin towns". Coventry Telegraph. Archived from the original on August 6, 2013. Retrieved August 6, 2013. ^ "Coventry – Twin towns and cities". Coventry City Council. Archived from the original on April 12, 2013. Retrieved August 6, 2013. Wikivoyage has a travel guide for Cornwall (Ontario). "Cornwall" . The New Student's Reference Work . 1914.